Unexpected complications can occur with any AV installation project, but the likelihood of unanticipated challenges increases when the project is a renovation versus a new-build project. This is especially true if the installation is in a 100-year-old brick school building, as Alpha Video & Audio in Edina, MN recently found out. In 2010, the Anoka-Hennepin School District in Anoka, MN closed eight schools as part of a budget reduction plan. Among these was the Sandberg Middle School, operating from the original Anoka High School built in 1904. The decision was made to repurpose this historic building as the Sandberg Education Center, complete with modern renovations. Renovations to the building included converting the old library into a new school board meeting room. Partnering with Dave Bridges at ATS&R Architects and Todd Johnson at Alpha Video & Audio, the school district designed a high-tech meeting room that maintains a few iconic furnishings from the building’s background. The challenges began with the size of the space, which, with the capacity for 120 attendees, was larger than the typical school board meeting room. Difficult sight lines necessitated a visual solution for the attendees in the back. This was resolved by the installation of two 70-inch Sharp monitors, located at the front and middle of the space. The size of the room also offered an opportunity to divide the room during the day so that two concurrent meetings could be held. To achieve this objective, two Christie Digital projectors and two electric retractable screens were ceiling mounted—one projector focused on a screen on the front wall and one focused on the screen in back. 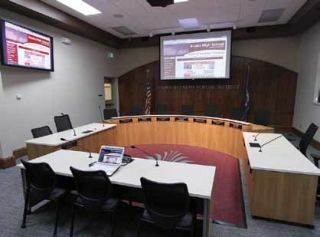 from the building’s background.The school board meeting room includes a seven-seat dais, a communications table located at each end of the dais, and a presenter’s table. Electro-Voice gooseneck microphones are located at each seat and Extron pop-up AV interface plates are available for attendees to plug in their laptop computers. Sound is provided throughout the room from 12 Tannoy ceiling speakers. Broadcasting systems were installed to make the school board meetings public on the local community TV channel. Four Panasonic HD PTZ cameras are installed in the room for broadcasting and recording. Adjacent to the meeting room is a small broadcast production control room. The specialized broadcast production systems include a Broadcast Pix MICA production system, VBrick encoder, AJA video converter, Tightrope Cablecast server, and LG monitors. A Crestron control system provides touch-screen control of all AV systems. A 12-inch Crestron touchscreen panel is available at the front of the room and a Crestron 10-button wall panel is installed on the back wall of the room. Support for an iPad interface to the control system is also available. Two other challenges occurred during the installation. One was ceiling mounting the projectors. To ensure a safe installation, the weight of the projectors was spread over several ceiling studs by using a specialized Chief ceiling mount kit. The second was the unacceptable temperature in the small control room from the heat of the large equipment rack. The ventilation of the equipment rack was improved by installing a Middle Atlantic thermostatic Long Pull Vent System to the top of the rack.